runwiseFX supplies groundbreaking Expert Advisors and Indicators for the Metatrader platform. Our flagship Strategy Automator EA combines a fully featured manual trade panel with the ability to perform actions automatically, in a highly configurable way. Can convert any indicator (or set of indicators) into an EA. One-click trading, lot size calculation, hidden (virtual) stop loss, trailing, hidden pending orders and take profit, scale in/out, robust error handling/re-try and more. Automatic and semi-automatic trading. Convert indicators into an EA without programming. 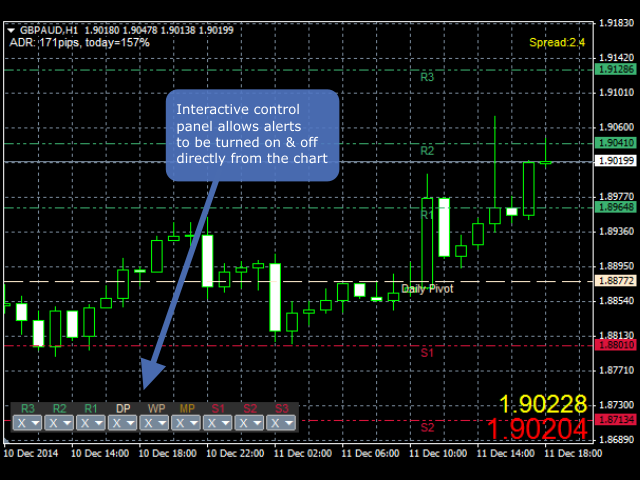 Rules can alert, trade open/close, set-up pending orders, scale in/out, set/trail stop loss/profit targets and more. Rules can take action based on custom indicator values (even if just have ex4) and candle prices. Rules can also output values on chart, push notify to mobile/email, take screenshots and more. We can help with bespoke rules to automate your strategy (this service is included in purchase price) but we also have library of ready-made rules that can be very easily added to your EA's configuration. The library includes rules for popular indicators, entry/exit, pending order setup, display of indicator values on multiple timeframes and more. 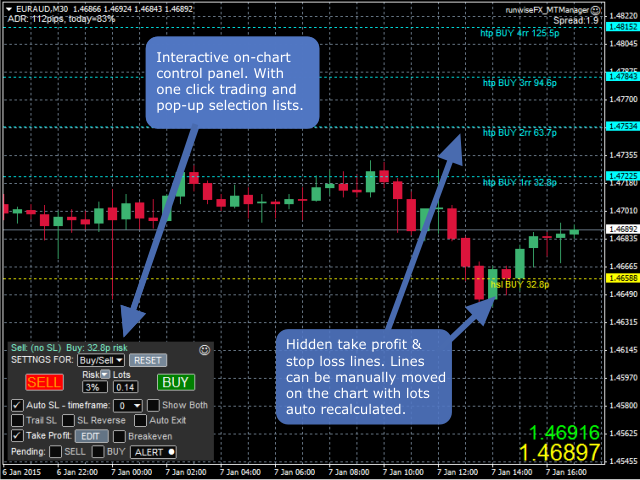 Get going straight out the box with our built-in indicators and rules for entry, exit, hidden pending orders, automatic stop loss, and more. Full money management with lot size calculation based on stop loss and risk percent per trade or fixed amount. Available margin is also checked with lot size auto reduced if necessary. 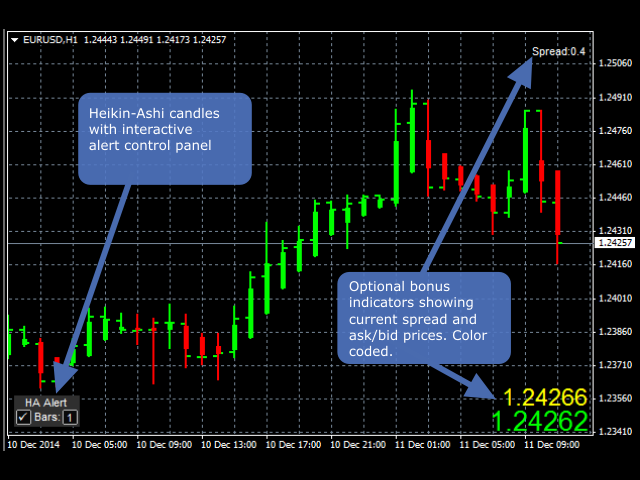 Set stop loss and profit targets directly from the MetaTrader charts, simply by moving a price line. One click execution is available, alternatively use our rules engine to perform automatic or semi-automatic trade entry/exit. Hide your real stop loss, take profit and pending orders from your broker - essential functionality for professional traders. Rules can be executed on many trades at once, allowing close, partial close, raise to breakeven, and more. Rules can work automatically e.g. close all trades before market close on Friday, or partially close trades/raise to breakeven before news events. View upcoming news events with various filter options. Our built-in rules allow you to receive alerts for upcoming news events and automatically take action prior to news. Extensive support for multiple accounts, where actions can be performed on many accounts at once. This works much faster than a trade copier. Accounts can be configured differently, e.g. different risk criteria, exit criteria, etc. Monitor execution speed and slippage on per trade basis, presented in a spreadsheet format. Join our email list and get a FREE MetaTrader indicator providing the essentials of support, resistance, pivots and daily range! We will not pass on your email address to any third parties and it is just used to keep you up-to-date with our developments. Email successfully submitted. Your indicator will be sent this address.